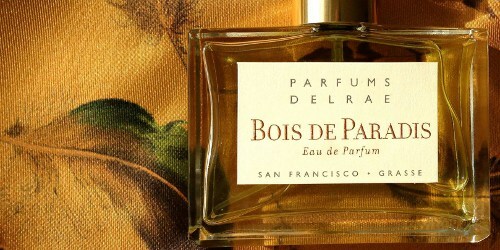 Nearly a decade ago, I sampled Parfums DelRae Bois de Paradis at a big city chi-chi perfume boutique. The person helping me sniffed my forearm and shook his head. “No. Not for you.” And that was it. I figured Bois de Paradis and I suffered a chemical mismatch. So, I moved on. Last week, I stumbled over my Bois de Paradis sample vial and decided to ignore the long-ago opinion and give it another try. I loved it! Bois de Paradis is a big-shouldered, purple-lipped, quick-to-laugh friend of a perfume, and it went straight to my “to buy” list to pull out when I want something easy and cheerful that won’t bore me. Parfums DelRae Bois de Paradis launched in 2002. DelRae Roth collaborated with nose Michel Roudnitska to develop the perfume, and it includes notes of citrus, French rose, blackberry bud, spices, fig, woods, balsam, amber, and incense. To me, it’s all dry wood and dirty blackberries, with just enough rose to marry the two. Bois de Paradis isn’t mysterious. What you smell — purple fruit, dark pink rose, wood, a leavening of jasmine and hint of incense — is what you get from first dab to last whiff several hours later. It’s friendly and welcoming, and it doesn’t take years of smelling fragrance to appreciate. Mom will like it. Your grade school niece will think it smells great. No one will trot out the “smells like an old lady” business. But Bois de Paradis isn’t banal, either. It’s not a fruity-floral cocktail that feels like it should be served in a punch bowl at sorority functions. It shows what good materials and a sophisticated grounding of incense can do — and, unlike so many popular fruity florals, all without an overdose of patchouli. I know I spend a ridiculous amount of time anthropomorphizing fragrance, but on first sniff, Bois de Paradis popped fully formed into my mind as someone who might play the wise-cracking best friend in a 1940s movie. She’s a messy brunette with an alto pull to her voice. I picture her wearing a tropical flower-printed kimono and pacing the living room, gesturing and laughing (maybe just a little too loudly) and talking about last night’s party. Parfums DelRae’s last release was Wit in 2014. I wrote to DelRae Roth to find out if the perfume house has anything new in the works. Roth replied that she’s been “working on a new fragrance for quite some time now,” but even with further prodding, she wouldn’t give hints of what the fragrance was about or when it might launch. We’ll just have to wait. Have you ever ruled out a fragrance based on your skin, then returned to it for a completely different impression? Bonus question: what fragrances do you find easy to wear, but not boring? Parfums DelRae Bois de Paradis Eau de Parfum is $150 for 50 ml. For information on where to buy it, see Parfums DelRae under Perfume Houses. I’m one of those people who don’t really believe in skin chemistry. I have however dismissed perfumes on first sniff only to be hopelessly smitten on further trials. I incidentally adore Bois de Paradis, it reminds me of a more insouciant version of Noir Epices, I tend to wear it in winter, but it doesn’t feel out of place in other seasons. I very much regret that Parfums Delrae is no longer carried by any European shops. I’ve tried their offerings up till Panache, and have been dithering about trying Coup de Foudre and Wit or not. I will never be able to buy them for a reasonable price as prices for shipping perfume to Europe are very high. So why try something, risk falling for it, and not being able to obtain it. Thanks for your lovely review and I wanted to ask: Which Delrae is your favourite? I know you used to be very fond of Mythique. Parfums DelRae seems to be in a weird place right now. (I say this without any special knowledge, mind you!) They seem to have less distribution, and I remember some sort of fire sale a few years ago. In any case, the website is still beautiful, and Luckyscent carries them. I still do love Mythique, and sometimes I crave Amoureuse and Emotionelle. I haven’t tried Wit, although I’d like to. It’s a shame if Delrae were to stop making perfume. It’s an excellent and very distinctive line. Wit is the one I’m most curious about, I’m sure Coup de Foudre is lovely, but I own way too many roses as it is. I guess I “believe” in skin chemistry, but I think it’s very changeable. Example: I bought a big set of Imaginary Authors samples about a year ago, and they were all terrible on me in a weirdly similar way (strange bitterish musk note). I decided that something in the base must not agree with my chemistry. I ran across one of the samples (Mosaic) this weekend and gave it a spritz, and thought it smelled fine. Not a love, but I couldn’t figure out what I was on about last year and decided that my chemistry must be a little different now. It makes sense that it would be changeable within the same person. After all, we change what we eat, how much stress we’re under, etc. As far as skin chemistry among a variety of people, I see that as different, too. I know, for instance, that lipstick shows differently on me. It’s the rare red–even among brick reds–that doesn’t turn fuchsia on my lips. Or perhaps your perception of the scent? I ordered my samples from them, because I was also very curious about the brand. Thanks a million. Poland has been my friend in the past as well. I ordered my bottle of MDCI l’Enlèvement au Sérail from another Polish online store. Who knew that Poland had such a good perfume selection? Love the idea of the Rhoda Morgenstern or Ethel Mertz of perfumes! Still laughing. I was thinking a brunette Eve Arden with a bit more sultriness, but it’s the same idea! Coincidentally I just got an email today from Parfumes DelRae with a 15% off with code SUMMEROFLOVE valid until end of June. Hopefully it’s ok to post that here(?) no affiliation. Robin often posts discount codes, so I’m assuming it’s fine. And, a nice tip! Great! I’ve ordered samples from their website – beautiful fragrances. Just haven’t committed to a FB yet. I yearn for a bottle of Bois de Paradis, but my bulging perfume cabinet and shrinking bank account make it ridiculous for me to think about it right this very minute. But, maybe in the fall…..
LOVE Eve Arden. Maybe Rosiland Russell if she played Vera instead of Mame? I haven’t tried this line although this one sounds fun and Wit had some great reviews. My easy to wear non boring choices tend to involve a soft leather: Bottega Veneta, Cuir de Lacombe Rosine Rose d’Homme. Yes, Rosalind Russell like she was in His Girl Friday! A soft leather is a wonderful, go-to comfort scent. Love this one, but for some reason the drydown doesn’t agree with me. I think it is the perfect marriage of roses and cinnamon. One of the younger Roudnitska’s best. I love Ciro Danger for roses and cinnamon (and lavender). I was so traumatized by the giant melon one that I have stayed well away form this brand. Based on this great review, though, I’ll give Bois de Paradis a try if I come across a sample. By the way, I know a very cool lady who wears lipstick in a slightly iridescent periwinkle or heliotrope color, very unusual, and it looks fantastic on her. Emotionelle might well traumatize a person, it’s true! I love it, though. I love the idea of iridescent periwinkle lipstick. I’d try it. BTW, I think I meant to say hyacinth (the deep blue ones) rather than heliotrope (which looks more magenta in Google images). VERY unusual color for lipstick. Hyacinth sounds great, too! I’ve worn and liked plum, but it would be fun to try something bluer. I think the key is that it was neither too dark nor too light (both of which are unattractive on most people in reality), and a duochrome, so that the glints were a pinker tone. I feel like I’ve seen a MAC lipstick like that. Giant melon one? I have no idea which one that is, but it sounds so funny and possibly terrifying! It’s called Emotionelle, and it’s a big floral cantaloupe! Definitely scary, like those thousand-pound monster pumpkins. To answer your first question: Yes, Chanel No 5. And we all know how that ended up – hate hate hate to love love love. The ones that are easy to wear and not boring: Bottega Veneta, Bois de Iles, Shalimar, Je Reviens, eau de Hadrien… just to name a few. I had a full bottle of Bois de Paradise for a few years but traded it on. I loved it, but as my perfumista years passed, I realized that I had too many rose fragrances (Ta’if, L’Arte di Gucci, and Nahema kind of ganged up on her), and had to let some go. BdP is one of those great, great orientals that is monumental but soft, and lasts and last and lasts for 24 hours plus. It’s all love because there is nothing else while you wear it! I love orientals and hope that one of these days full bodied orientals really come back into style. BdI reminds me of the original Fendi, Coco or Ysatis. Not how they smell per se, but in how they have this silky everything-but-the-kitchen-sink, movement by movement, floor by floor, composition that you can’t ignore. All the parts are interesting and have something to offer. No. 5! The ultimate comfort scent that does not bore, once you’re adjusted to what No. 5 is all about, that is. It took me a while to cotton to it, too. I will be benevolent enough to not write what I would have said to Mr. ChiChi perfume salesman, but suffice to say he would not be so quick the next time to value HIS opinion above the customer’s. Bois de Paradis and Mythique are the 2 bottles I own and enjoy from this house. Cheers Angela and Rosalind Russell all the way! !! I’ve learned since that experience to actually rely on my own opinion, but I wasn’t confident enough of it then. I truly love Bois de Paradis and would probably rank it in my top 5 all-time perfumes. But it’s a close call with Amoureuse which no one has raved about yet so I will. It’s not the loud friend, it’s the diva who takes your breath away and inspires you! Amoureuse is wonderful! I think Bois de Paradis would be more versatile for me (Mythique is super duper versatile), but I cherish my sample of it. Amoureuse is really lovely. I need to re-test some of the others. I wore a drop of Amoureuse tonight, thanks to this comment, and it was a nice accompaniment to a Thai dinner with friends in the backyard. I’m with you, Calypso – definitely in my top five. I’m on my second bottle (and Sharon C., if you’re out there and reading this, I’m sending you a big fragrant hug). Bois de Paradis is one of the perfumes that demonstrated for me – in my early perfumista years – just how incredible a scent can be. I remember upon first smelling it having thoughts of, “Oh. OH. That’s so beautiful. That’s just, just – so beautiful.” Yes, the perfume and I had a moment, and we continue to do that every time I wear it. I can see how BdP could conjure up images of a 1940s dame, but for me, it tends to evoke a sense of place, rather than person. It’s like that area where a forest meets a clearing in some fantasy movie – the forest is deep and dark, and the clearing is light and dotted with the most gorgeous blooms. Amoureuse is another lovely one, but tends to be overwhelming on me unless I dab very, very lightly. For that matter, I dab BdP as well – it’s got great sillage and longevity. Emotionelle is another “dabber,” too. These are some big perfumes! And I adore your description of the forest and the clearing. I always have a bottle of BdP on hand, Angela – can I send you a few mls to keep you going until fall? Send me a note at lisadarty in the haute mayle realm. BdP evokes a sense of place to me too, in fact one similar to yours, a mysterious glade in the woods, but at night with stars overhead. Like you, I dab it (that is, spray a teensy spray on one wrist, then dab that about) to keep from being overwhelmed. Btw, it’s a beautiful fragrance in the high desert. I always wear it when visiting my friend in Santa Fe, where the wood in the perfume echoes the scent of pinon smoke in the air. What a wonderful, calming image! Would you say there’s obvious iso e super? The dry woods comment in recent releases always seems to mean that! There is both a sandalwood and cedar-like feel to the wood (cedar makes me think of iso e super), but I don’t smell Bois de Paradis and think of it. I’d love to know what others think. I don’t believe in skin chemistry. No, wait, I do believe in skin chemistry, but I DO NOT believe in the technique the salesperson deployed on you. I definitely have perfumes smell different on me than on other people — my spouse, for example (since I don’t believe in boy vs. girl perfumes and anything I convince him to buy is probably something I’ve already at least tried). But the minute you mentioned that a salesperson took one sniff and told you it was wrong, I distrusted the salesperson immediately. There’s a store in Seattle that does this — Parfumerie Nasreen — and I HATE it. You walk in, they ask you what your favourite perfumes are (not the notes — they want to know what lines the perfumes are), then (surprise, surprise) they recommend a couple of lines a notch more expensive than that, they spray them on your arm, and they insist, within a minute, that one perfume is “you” and the other is “not you.” I mean, they’ve never met me before that minute, so how could they possibly know? It’s not skin chemistry, it’s a technique to point you to an expensive perfume they have a lot of and that they want you to buy. Invariably, five minutes after you leave the shop, the perfume that was “so you” turns to bug spray. This has happened to me more than once with that shop…so, I guess, my fault (fool you twice…but I was saddled with a gift card that was an absolute albatross and which, despite repeated attempts, I still have $100 of that I will never, ever use because they don’t carry the lines I like). But hearing you say that a salesperson had tried that technique on you made me immediately suspicious! I’m glad you tried again. I’ve heard great things about Wit but have never gotten around to getting a sample…I’m inspired to move it up on the list. I’m sorry you had such an awful experience! I’ve been to Parfumerie Nasreen, but it’s been years now–at least ten. I had a great time. (I don’t think I actually bought any perfume, though.) It’s a drag to be thought of simply as a checkbook. I haven’t tried Wit yet, either, but I love Daphne, so I know I’ll sample it eventually. Oh Bois de Paradis! Back in my early perfumista days I got samples and then a bottle of this when Harvey Nicks still sold the line. I loved the fig note. It was a bowl of autumn lusciousness to me. Then one morning (very early) I overdid it as I was booked on a train to do a site visit in the west country and overslept and the cab was outside so only time for quick wash (and perfume). I smelt fabulous of course but it was overwhelming and I swapped a lot of my bottle away after that. Thankfully I still have a couple of mls left and can now enjoy it again. I love what austenfan said above about it being a more insouciant version of Noir Epices – that is bang on for me. (I get cedar rather than incense but it’s still lovely). Sideris is my lovely not boring choice. I’ve done the “overdone it–now forget it” thing, too! I’ll probably never wear the Diptyque tobacco scent now because of it. It’s sort of a fragrance hangover.